How to figure out what something in the sky is? A while ago I saw something in the sky early in the evening. At first, I thought it was a plane since it seemed far too bright to be a star - no other stars could be seen. However, it didn't move, so I ruled out that possibility. It seemed to be relatively close to the horizon so I considered if it was a very high pole with some sort of light at the top, but after I walked for a few kilometres it was still at the same location. During the few hours I looked at it, it moved a bit across the sky. I considered a satellite, but it didn't seem to move quite enough of what I anticipated a satellite would move. Since then, I have seen it every evening when I remember to look for it. Apart from this object only the moon could be seen. To me, it seemed like the moon moved in the same arched way across the sky as the object, but I could be wrong on the. I have seen several questions on this site where someone asks "what was it?" which has been closed with "too broad". So I am not going to ask what it was. Instead I am curious about what I can do to figure out what it is? Which observations is relevant to make when looking at such objects? As someone who is curious about the sky, but does not have any instruments for doing any actual measurements can I actually do anything? 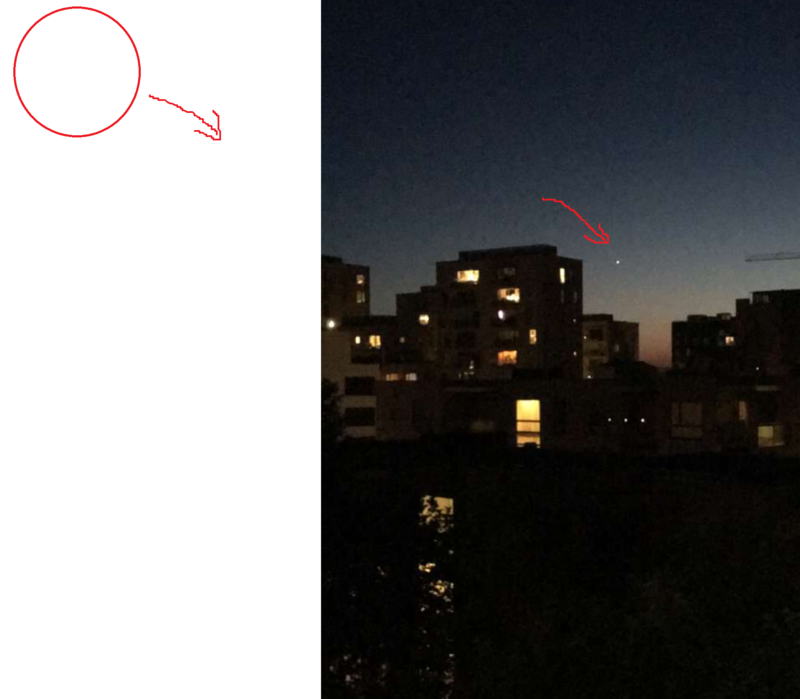 The first picture shows the object in the sky. The second picture shows the same object, but where I have indicated the arch the object moved in as well as the moon and how that moved. It could be Venus or Jupiter. To help you identify the object, you could install Stellarium, an open source planetarium. You could also try to record the azimuth with a compass as well as the exact time. A compact camera with a good zoom should be able to show the phase of Venus. If it looks like a very small waxing moon, it is Venus. If it's a full disk, it's probably Jupiter. These guidelines are only valid now, and will change over time. Stellarium will help. It's hard to say 100% for sure without more info. What is your location and what date/time was this? How fast did it seem to move? To me, it looks like Venus. 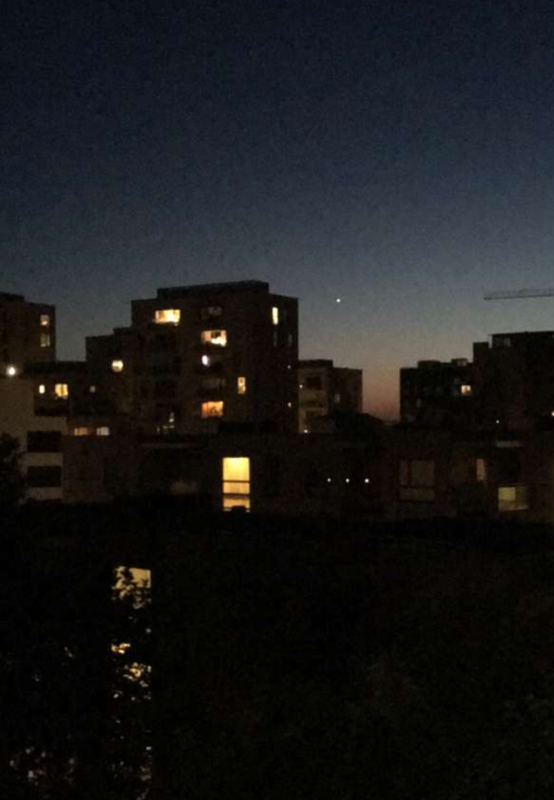 If it looked like a bright star, but much bigger and brighter than other stars, in the west around sunset, and moving slowly toward the horizon, then it was most likely Venus. First, to figure out at what exact direction you were looking at, use Google Maps and set your location where you took the photo and then find for example that building to the left of the star on the map as a reference point and see on the map at what direction you were pointed (it doesn't have to be super precise, just whether it was south, south-west, west etc). Set the location, date and time of when you took the picture and then look in the direction you determined earlier. Based on your picture, I'd say the altitude (that is, the angle between the ground plane and the star) is not more than 15 degrees. So then look at the brightest star or planet in that general direction and below that altitude line and I'm sure you'll figure it out pretty easily. That's at least how I do it. Stellarium on your laptop, or SkySafari on your phone, could help you identify the object. Not the answer you're looking for? Browse other questions tagged identify-this-object or ask your own question. What bright body is next to the Moon in these photos of the ISS transiting the lunar disk? How did they make a video of the center of the galaxy, and what is it exaclty that's flashing there?